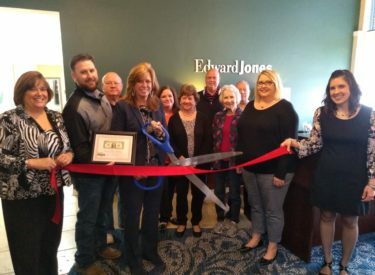 The Ponca City Area Chamber of Commerce held a Ribbon Cutting Ceremony for Mary Maddux Edward Jones Office. Her office is located at 205 E. Cleveland. Mary is cutting the ribbon along with Garrett Bowers, John Bley, Lynna Cline, Winnie Myer, Bruce Maddux, Lois Thornton, Orville Thornton and Renea McKain. Holding the ribbon representing the Chamber are Robyn Carpenter and Casey Pruitt.